In Pop Shop, we support the dying art of physical shopping by visiting independent record and bookstores with some of our favorite actors, writers, directors, and musicians. 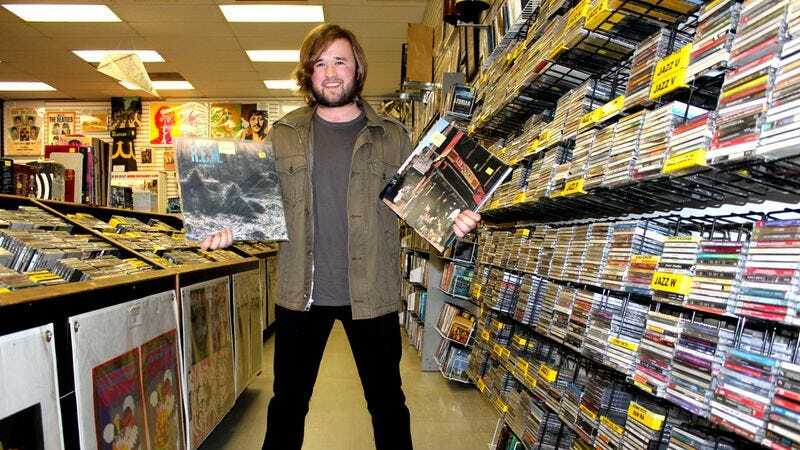 This week, we met Haley Joel Osment at Rockaway Records in L.A. The shopper: Haley Joel Osment’s career is a heavy, double-edged sword. Once known for uttering one of the most ubiquitous lines in movie history, he also worked with Spielberg before he could drive and got on a bus with Tom Hanks’ assistance in Forrest Gump before he probably knew about the birds and the bees. Not wanting to sustain that kind of momentum, Osment relocated to New York City and got his degree from NYU. After his last major motion picture, the mildly received Secondhand Lions, Osment has had an adult resurgence, appearing prominently in the Funny Or Die-produced IFC melodrama spoof The Spoils Of Babylon. With roles in the upcoming Entourage movie and Kevin Smith’s new horror-comedy, Tusk, life just keeps getting more surreal for the 25-year-old, who, yes, looks exactly the same, only bigger. Haley Joel Osment: This is an album I listened to a bunch in high school. One of my favorite production stories is that they lost the tapes to “If 6 Was 9,” because it got ruined in the studio or left in a cab, and they had to go back to Mitch Mitchell’s apartment and find another take of it that was all crumpled. They were trying to rush out the album at the last minute, and they were trying to iron out, with a cold iron, the tape to try and make it work. It is sort of a weird track, and you can almost hear things come in and out. I imagine that I’m hearing that. The A.V. Club: Plus it’s in Easy Rider. Maybe Hopper stole it. HJO: [Laughs.] That’s a hell of a soundtrack. Very cool. AVC: What was the first record you fell in love with? HJO: That’s in the stack, actually. This was honestly the first album I ever listened to, and I listened to it on cassette, which is R.E.M. Murmur. My parents are from the South—they were both born in Birmingham—so my dad saw R.E.M. really early on when they were playing college stuff in Athens. He had a bunch of their cassettes from the ’80s, and when I was 8, 9, or 10, those were the sort of things that were around the cassette player in the living room. AVC: You “got” R.E.M. at that age? HJO: No! Not at all. I enjoyed listening to it, particularly lyrically—Michael Stipe is pretty poetic, and there’s some subject matter that I really wouldn’t have gotten at that age. It’s funny because I remember liking the music as a kid, but the lyrics were so beyond me at that age. I was actually looking for Monster, because that was the first R.E.M. album, even though it’s not really highly rated, I love the guitar on that album. Stipe is doing this pose that’s not his typical thing, and Thurston Moore has a vocal on that, and I think it’s a really cool little moment in their career. AVC: Were you sad about the breakup? HJO: I think they did it at the right time. I think they knew that a lot of their records in the later 2000s weren’t too well received, and so they put out one that kind of pleased everybody and went out on a good note. AVC: So you’re definitely a big music guy. HJO: Yeah. That was really up there on the list of why I chose to relocate to New York, because the live music scene there is incredible. It’s good in L.A. too, but you can walk to a good concert almost every night of the week in New York. That was hugely appealing to me at the time. HJO: Yeah, and they did [Beck’s] Odelay too. I loved Odelay in high school, too. It’s genre-hopping, but also cohesive. It’s like this fun, fantasy world. “Hey Ladies” is great. How do records work again? There’s no track listing on these. Oh, “Egg Man.” The sample is from [Curtis Mayfield’s] “Pusherman,” I think. AVC: Can’t get away with that sampling these days. HJO: No, you can’t! Well, I guess you can, but you just have to have a huge label that’s willing to do that for you. It’s funny to think now that you can just pull all this stuff on your laptop, and they had to go digging for all the samples. Ad-Rock was saying, when MCA died tragically, how this was when he became aware of what a great artist MCA was, because they were just messing around the house, and he got a football helmet and taped two mics to it, just going around rapping in this football helmet. Just creating, and freeing up his hands, and having a different physical relationship to it. You can tell how much fun they’re having on this record, which is also appealing. HJO: I think everybody would probably agree, including the band, that their best records are elsewhere, and I hear them say all the time that the way they recorded it, they wished they had taken a few tracks off and condensed it down a bit. It’s their longest record, as far as I know. This is a real point-in-time record, because I was 15 or 16 years old, and it’s not an explicitly political or anti-Bush record, but that 2004 election, you start to feel like everything’s going to be pretty crappy from here on out, and that feeling comes through in this record. AVC: So this was your angry teenager record? HJO: Yeah! They recorded it in like two weeks and in L.A. It’s a little messier, and not like Kid A and Amnesiac, where they spent years on those records. AVC: Were you ever in a band? HJO: Yeah, but just a bad high-school one. I still like to play music, but just as a private, for-my-own-enjoyment kind of thing. AVC: Now for your DVD picks. Let’s start with the hilarious, feel-good Dogtooth. HJO: I love movies where I go in blind and have no idea what’s going to happen, and this is a perfect movie for that. For your readers who don’t know, it’s about a family that lives in a compound in suburban Athens, [Greece] I think, and the elderly mother and father have three adult children, and they’ve never allowed them out of the compound. They’ve created this entire world that’s sort of self-contained and their own vocabulary. It is hilarious at times. AVC: It’s like a disturbing Brady Bunch. They can’t leave until they lose their fictional dogtooth. HJO: Spoilers: The girl is hitting herself in the mouth. Then someone smuggles them this VHS of Jaws, so this 25-year-old woman, who has never gotten to see anything from the outside world, she’s by the pool and doing all the lines from Jaws. AVC: This is a drunken Paul Newman, right? HJO: Probably my favorite Newman thing, probably my favorite Mamet thing. Sidney Lumet directed this, and it’s just everybody at their best. This is actually Bruce Willis’ first movie. He’s an extra sitting in the courtroom in a yellow shirt. This was 1982. I think the story went that Newman won for The Color Of Money, and it was kind of like the mercy Oscar, where, “We should have done it two years ago, but here it is.” This is one of his best performances. It’s typical Mamet, where everything is economically designed and falls into place perfectly. There’s not a wasted minute. AVC: Did you talk to Bruce about it? HJO: No, I definitely hadn’t seen this when we were making The Sixth Sense. AVC: It’s easy to forget how young you were, like 8 or something? HJO: [Laughs.] Ten. I had seen Die Hard. Actually, Die Hard was the first movie I ever saw in the theater. When I was a newborn, my parents were going stir-crazy in the house, and they put me in the bassinet and I slept through Die Hard in the theater as an infant. AVC: Do you guys keep in touch? HJO: He’s contacted me a few times in the intervening years. He was really nice to my family and me. He would call the house just to see what was up, especially right after The Sixth Sense came out. With a film like that, we did premieres in every European country. We went to Japan twice. I did not appreciate Japan at that age, because I was too young to really get the food, and I remember Bruce daring me to eat a basket of live crabs. I did not take him up on it. AVC: What do you think about M. Night Shyamalan’s late-period work? HJO: He also calls from time to time—and Spielberg does it too, keeps tabs on the young people that they work with—so he’s been kind over the years. I think that people aren’t as happy with his recent work. It wasn’t his first movie, but when your first big thing is a script that is that good, and when we were shooting, I think everyone was aware that as long as we don’t get in the way of this script, it’s going to be great. It’s tough to please people after that. I think that he’s such a good director, aside from the writing, that he could have a much bigger range than thrillers. I think he’ll eventually do that. Unbreakable is just shot really, really well. He has a very interesting visual style that could work in films that aren’t necessarily horror. AVC: Did he give you a lot of direction, or did you just think, “I know this kid”? HJO: What was awesome about that movie, and it seems like a thing of the past, is that we got three weeks of rehearsal. Just Bruce, Toni Collette, Olivia Williams not feeling under the gun. We’d sit in the hotel conference room running through the scenes and talking through them. We did a table read with the whole cast, and with most movies I do, everybody just shows up and starts shooting immediately. To his, and most of the other director’s that I’ve worked with, credit, there are times when tricking a kid into a performance works. Like Kubrick did with Danny Lloyd, where he didn’t know it was a horror movie, and you withhold things from children. HJO: I think that was appropriate then, because Danny Lloyd was a little younger than I was. HJO: This one really grabs you, because it’s so tragic with [Steven] Drozd and all of them. Wayne actually gave me this DVD after it came out. I was doing a tiny little indie in North Carolina, and we hadn’t cast this one role of the bad guy who shows up later in the movie. We were shooting already, and trying to call up actors in L.A., and the costumer had been on the Flaming Lips tour, and was in charge of making Wayne Coyne’s white suits and cleaning them when they get bloody. We were talking about The Flaming Lips, and she just said, “You know, I have Wayne’s number.” And we were like, “You know what? Let’s call up Wayne Coyne and offer him a role!” She called Wayne, told him the situation, and without getting any more information, he got in his van with his wife and drove from Oklahoma to North Carolina. He hung around the set, and just talked to people. That’s just the kind of guy he is. AVC: Your last major studio film was Secondhand Lions. Do you feel rejuvenated right now? HJO: Yeah! I think it was more that I got really lucky at a really young age. I got to do The Sixth Sense and Spielberg’s A.I. right after that, and that’s a ridiculously fortunate run that you can’t just do forever. Secondhand Lions, 10 years ago, was my last big studio film. It was really the factors of going to college and not being in L.A. looking for roles. The films that I did do were little indies that didn’t get enough money or get distributed, or just never saw the light of day. As an artist, I feel that everything hangs together, and that it was always a process of discovering the actor that I wanted to be, and where I wanted to live and how I wanted to do things. It’s cool to now be coming back and doing more public things with that knowledge, feeling like I’ve figured out my personal path and whatever happens professionally is just bonus. AVC: The Spoils Of Babylon must have been a blast. HJO: It’s a great time for comedy, for writers, and comedians. If you have a funny Twitter feed, you might hook up with somebody who will put you on a show. AVC: How did they contact you for the show? HJO: That was some excellent work by my agent. My agent/manager went after it, and I don’t know what Ferrell and those guys had seen recently from me, except they knew I was doing a comedy series for Amazon called Alpha House, but it was a tremendous opportunity. Kristen Wiig became a star on SNL the year I moved to New York, and to do something with someone I admire so much was awesome. AVC: Did you play music for Wiig and Tobey Maguire? HJO: No, we didn’t get to hang around the iPod speakers unfortunately. AVC: You’re in Tusk, the Kevin Smith movie coming out soon. That means you just hung around and got high all day reading comics?